Remember when we promised that we would tell you how the hot sauce was? That was back on September 9th, and we said we’d get back to you in a week after it had aged. Now it’s been more than two weeks, so we owe you an update. The Louisiana hot sauce was really good. 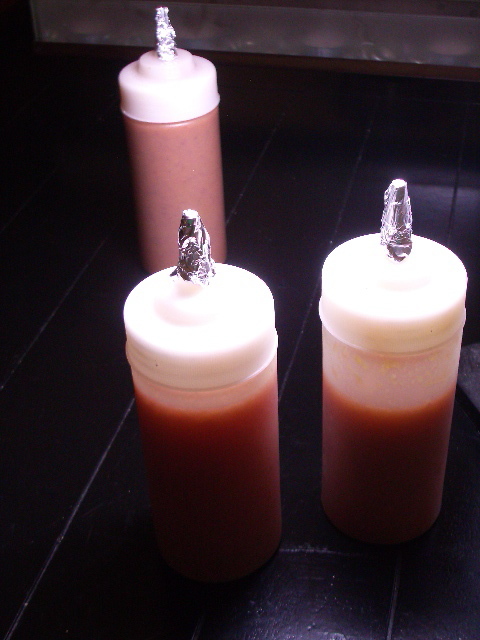 We would recommend the recipe for its simplicity and the rewarding feeling of making one’s own hot sauce. Is it as good as Tabasco? Maybe not, but still well worth the effort. Woah woah woah. There are 3 bottles in that picture! That’s because in the meantime, we made a new hot sauce! 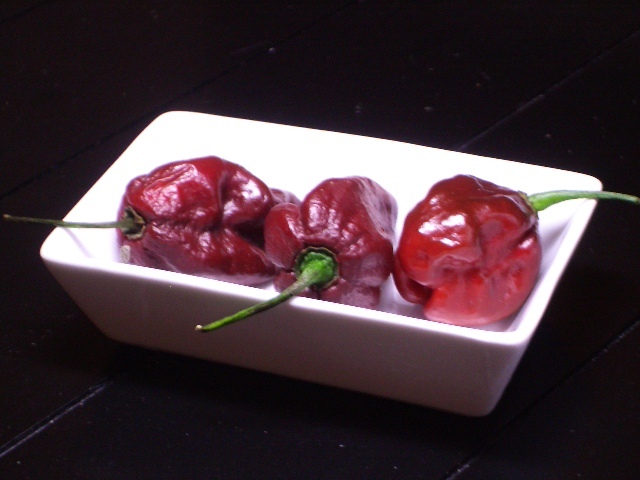 From the same great people at the farmer’s market, we got some chocolate habañero peppers. They are really hot! Wikipedia, always a good resource, has some good information. This new recipe is a lot more complicated, but it’s just from reading some basic recipes online and then having fun with what we had in our spice cabinet and our kitchen. Hot sauce experts out there may call us crazy, but after tasting it, we’re proud to recommend the recipe to you- just don’t try too much at once!